In 2017 it was estimated that every second 2,500,000 emails were sent, that equates to approximately 206 billion per year. Business emails sent are 120,000,000 per day. 10% of emails bounce and approximately 20% are opened, this means that 70% of all emails are never read. If you are using email marketing to develop business and grow sales you may be disappointed with the result, the big benefit of emails is that they are free. If you decide to write to your prospects you can be sure of one thing, all letters are opened. Letters are perceived to be more personal but there is a cost and it obviously takes longer to reach the customer but guaranteed to be opened and read.Click on this text to edit it. 1. Who are you sending it to? 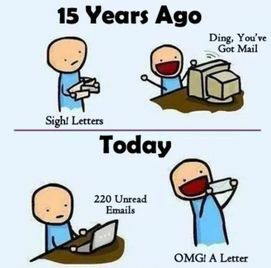 If your target market is of a generation that are used to getting and sending letters, use letters. 2. If it’s a thank you or an important message, use letters. 3. If you want the communication to only be seen by that person you are contacting, use letters. Emails are essential for instant communication for keeping records of conversations and have transformed communication time. It really depends on the purpose of the message and especially if you are using emails to develop business, a 30% read rate also means a 70% unread rate. A well written letter and a follow up phone call to arrange a meeting may yield better results overall. If your marketing efforts are not producing the desired result contact us for a free consultation.